ADF Practice: ADF BC. Programmatically populated VO example. In this post I will show how to build view object and display information about PL/SQL procedure's parameters. How to get this information you can see in the previous post ADF BC. PL/SQL procedure params. // ---    File generated by Oracle ADF Business Components Design Time. // ---    Custom code may be added to this class. // ---    Warning: Do not modify method signatures of generated methods. * This is the default constructor (do not remove). * hasNextForCollection - overridden for custom java data source support. * getQueryHitCount - overridden for custom java data source support. hasNextForCollection(qc); // Prime the pump with the first row. There are two most important methods to focus your attention: retrieveParamsResultSet and createRowFromResultSet. 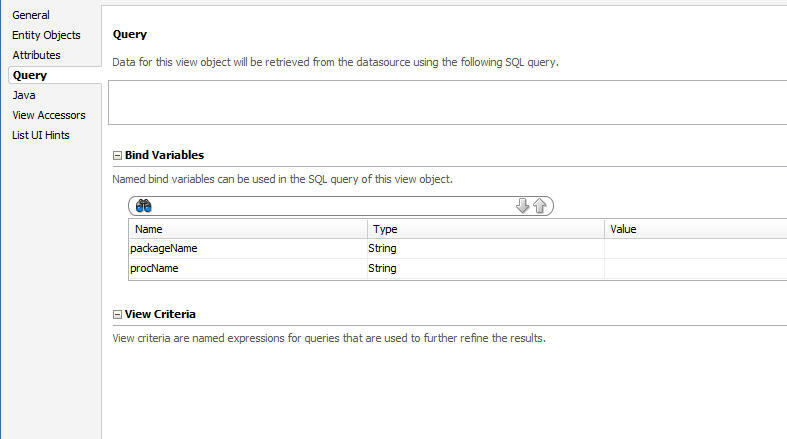 Method retrieveParamsResultSet actually retrieves data from your alternative datasource. 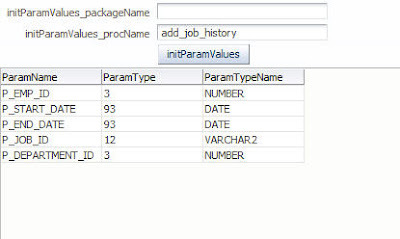 In my case this is some static method supposed to return information about PL/SQL procedure's params represented by ResultSet with three attributes (COLUMN_NAME, DATA_TYPE and TYPE_NAME). 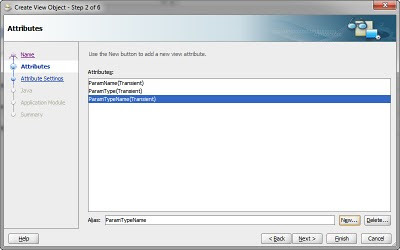 Method createRowFromResultSet creates new row and populates attributes of your view object by values of COLUMN_NAME, DATA_TYPE and TYPE_NAME. In addition I defined two parameters (bind variables) for my VO - packageName and procName (PL/SQL package and procedure names to be described). 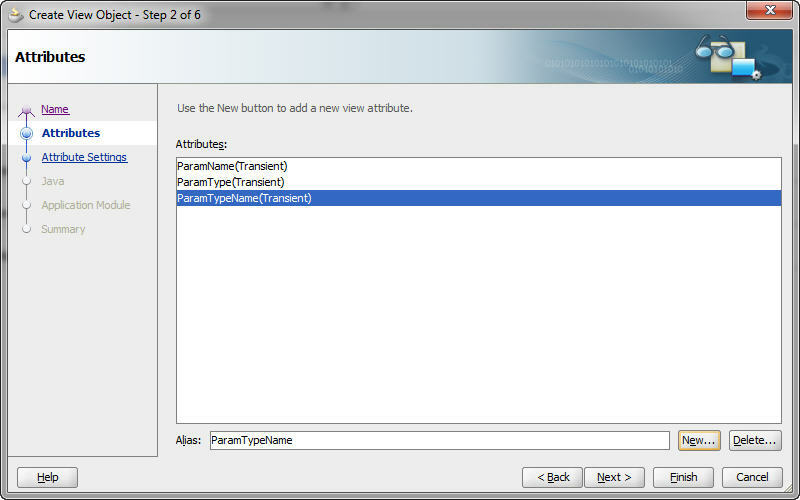 Download sample application for this post - AppOraStoredProc.zip. 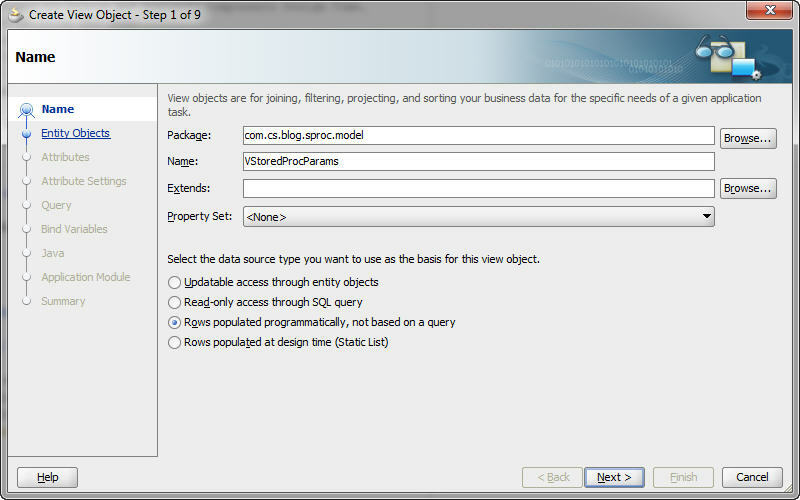 It requires connection to standard HR scheme in Oracle database. I'm referring to the following link to populate VO programattically. When run in debug I see that resultset is getting returned appropriately and is calling the methods overriden as per the link. However, No data is displayed in the table. Probably the cursor in your resultset object is positioned at the end. Debug hasNextForCollection method to check this. Hi! So, what's wrong with this code? The concept is correct. I can not say whether it works or not. I don't know what is customerID, homeEntityID, linkText. Do you have any exposure - " How to handle the viewcriteria for programmatic VO ?" 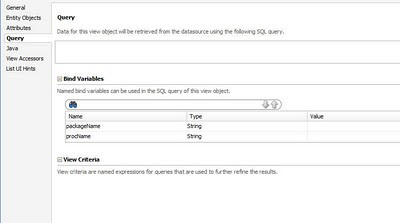 Since the VO is being populated programmatically, you can't let the framework perform filtering in the database, because you don't have a SQL query. So, you have to specify "In memory" query execution mode for the View Criterias of the programmatically populated VO. Is it possible to enable pagination support (i.e.range paging) in a programmatic view object ? Yes, it’s possible. This technique is a bit more complicated than provided in this post. I think I’m going to blog about it. But the question is in your datasource used in the PP VO. 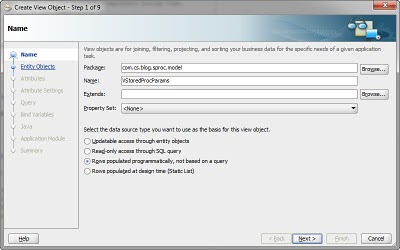 Does your datasource support pagination? Can it provide a page, I mean a portion of rows that you need? For example a set of rows from number 10 up to number 25. Only in this case you will gain real benefits from the pagination feature. Did you blog on this topic ? I would like to enable pagination support too. Is it possible (and is there value) to programmatically populate an Entity Object so that multiple View Object instances can shape the data as needed from a single version of the PL/SQL results? I have implemented the same scenario by overriding executeQueryForCollection(Object qc, Object params, int noUserParams) in VOImpl and called stored Procedure and mapped the data by overriding ViewRowImpl createRowFromResultSet(Object qc, ResultSet resultSet). I have exposed the VO as Table and its working fine. Now I have a requirement to sort the data in table. Please help and suggest how do I achieve it??? Are you going to sort the data yourself programmatically or you need to allow users to perform sorting? if you have any idea then please help. ADF BC. PL/SQL procedure params.